Show Date Time on titlebar of active window – cool tweak! Are you too obsessed with current date and time? If yes, then TBDT (Titlebar Date Time) can help by displaying date and time information on active window. This small utility show current date and time on the right side of the title bar of an active window. It sits on the system tray and provide following options (as seen in screenshot below). Did you notice date and time in title bar of above window? Similarly, this utility show date and time information on title bar of any active window on your computer. 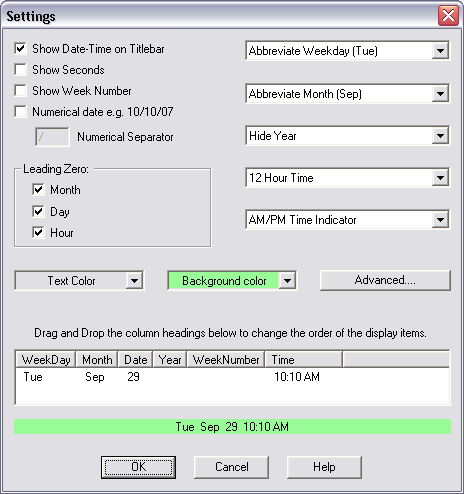 You can configure the format of date display and background color using settings window (as seen below). This program is available in both install-able and portable version. Download portable TBDT [82KB] or see download page for downloading other versions of this free program. Small tweak to stay updated with date – time information all the time – like it?